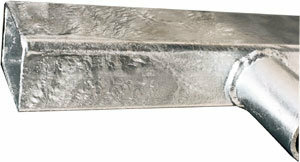 Protect all the parts of your new frame with hot molten zinc. Because it has been completely submerged in hot zinc, all parts of the surface are coated inside and out, including awkward corners and narrow gaps. Hot dip galvanizing has many years of proven performance and can last up to forty years or longer. It weathers at a slow rate, giving a long, predictable life. through drilling, cutting or accidental damage. Hot dip galvanizing is unique because the coating bonds metallurgically with the steel, giving a much greater resistance to damage than other coatings. And yes, with proper professional preparation, it can be top coated with paint. Galvanizing is warranted with a limited 10-year rust-through warranty.